in’Ove is a livable piece of art, recyclable, ecological, evolutive and is aiming towards a large public from the baby, the student, the professional to the art fan. From the interior design to the outside shell, the egg is modular to your wishes, according to the season, your mood, your taste or simply according to your life. The in’Ove can be customized with different colors, materials such as wood, leather, laquer, marquetry of any kind. The interior and the exterior can be totally customized and are evolutive. 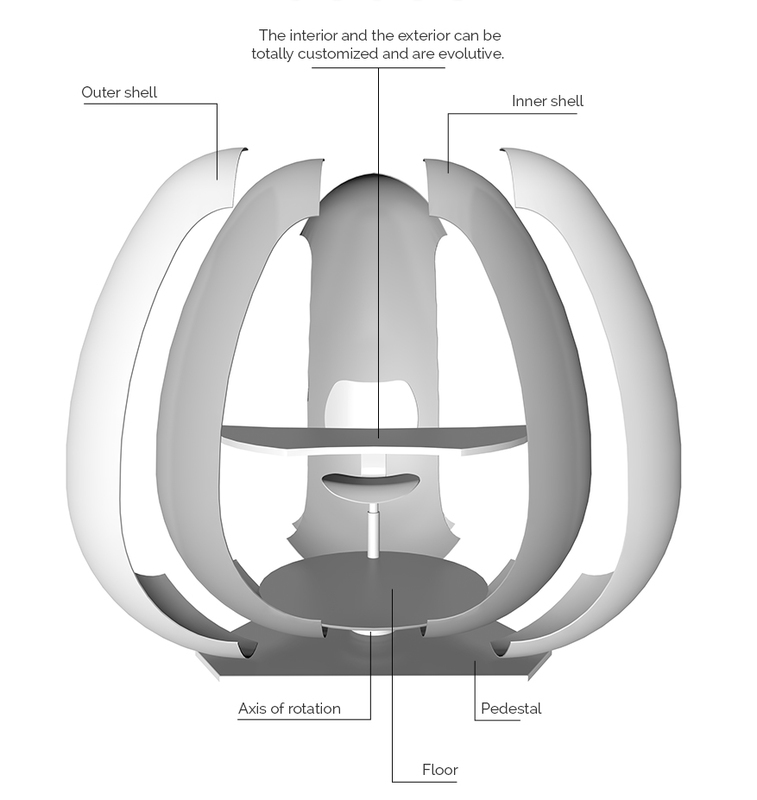 Made out of a double shell, the egg is provided with an electrical motor which allows in’Ove to be open or closed. With a security sensor it is equipped with an anti pinching system. There is also a manual release in case of motor failure It can move 360 degrees and the base is made to allow a stable seating without balancing movements. in’Ove is proposed, in its basic version, with a desk version equiped with an arm chair and the outside will be white laquered. The in’Ove structures are made out of an inovative beenest material, very resistant and allowing complex and light shapes. in’Ove has an original conception allowing an easy mounting and demounting system 2 meters high, 1,5 meters wide.